Gylfi Sigurdsson was the difference as Everton beat a resilient Cardiff side 1-0 at Goodison Park on Saturday to move sixth in the Premier League, writes Sky Sports. The Iceland midfielder, ruled out of the international break through injury, broke the deadlock on the hour mark by tapping into an empty net after Theo Walcott's powerful shot cannoned off goalkeeper Neil Etheridge, as the Toffees sealed their fourth consecutive home victory. Marco Silva's men dominated both possession and chances but Cardiff defended well and had a late penalty appeal turned down after Greg Cunningham was brought down by Seamus Coleman 11 minutes from time. The result moves Everton up to sixth in the Premier League while Cardiff remain 18th, just inside the relegation zone. The game started slowly, with Everton well in control and dominating possession, while Cardiff were happy to sit back. Neil Warnock's side defended well - Sol Bamba with some crucial interceptions and clearances - while counter-attacking with pace when possible. Andre Gomes, who put in a strong performance for the hosts, fired into the side-netting midway through the first half but there were no clear-cut chances in the match until the 40th minute. The first real chance was a golden one, with Richarlison getting on the end of Sigurdsson's long-range free kick, but firing his header straight down the middle and into the hands of Etheridge, despite being completely unmarked inside the box. 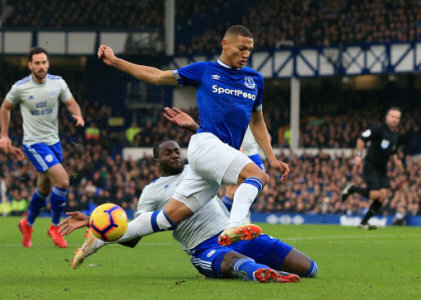 Everton then had another good opportunity right on the verge of half-time as Gomes burst down the left, beating Bruno Ecuele Manga, and hit a perfectly-timed low cross. It just needed someone to connect properly, but the ball bounced off Walcott's shin and out for a goal-kick. The second half started a lot brighter as Bernard found Sigurdsson with a perfect pass through the middle on 55 minutes, but the 29-year-old rounded Etheridge only for Bamba to clear off the line. Former Swansea man Sigurdsson then found the back of the net as Walcott burst into the box from the wing, forcing an excellent save from Etheridge, before tapping into an empty net. Victor Camarasa tested Jordan Pickford from distance on 72 minutes before referee Paul Tierney denied the visitors a late penalty as Cunningham went down from a challenge by Coleman. Substitute Ademola Lookman could have killed the game eight minutes from time but Etheridge denied the England U21 international with a good save, while Callum Paterson's header in the 89th minute sailed over the crossbar from just a few yards out as Everton held on for all three points. Everton are unbeaten in their last nine home top-flight games against Cardiff (W7 D2). Cardiff have scored fewer away goals than any other side in English league football this season (2). Cardiff have lost all 10 of their away Premier League games against the six sides to have been ever-present in the competition (Arsenal, Chelsea, Everton, Liverpool, Man Utd and Tottenham). Everton have lost just one of their last 10 home Premier League games (W6 D3). Everton had 71 per cent possession - their most in a Premier League game since February 2016 (76 per cent vs West Brom). Since the start of last season, Gylfi Sigurdsson has scored more goals in all competitions than any other Everton player (13). Everton: Pickford; Coleman, Keane, Mina, Digne; Andre Gomes, Gueye; Walcott (Lookman 73), Sigurdsson (Zouma 90+2), Bernard (Tosun 77); Richarlison. Subs not used: Stekelenburg, Baines, Davies, Calvert-Lewin. Cardiff City: Etheridge; Manga, Morrison, Bamba, Cunningham; Arter (Hoilett 72), Gunnarsson, Ralls; Camarasa (Ward 85), Harris (J Murphy 66), Paterson. Subs not used: Smithies, Peltier, Bennett, Reid.